Experience what it's like to fall like a stone, at speeds of up to 200kph, from 15,000 feet. If the fear doesn't cripple you, you'll be rewarded with majestic views of the Remarkables, and all the sheep on the working farm below - bullet sized pieces of white fluff that will soon loom bigger, the faster you rush towards them. 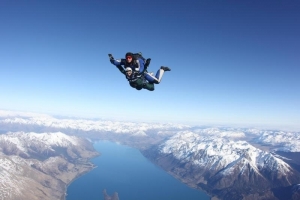 Other skydiving options include jumping from Glenorchy, tandem jumps over Fiordland National Park and Mt Aspiring and of course from the all-year round resort of Wanaka. Most companies offer DVD and photo packages, to make sure you actually get to see what you just did, as your eyes were probably screwed shut the first time around.